The Peace Corps announced Tuesday that the University of Washington ranked No. 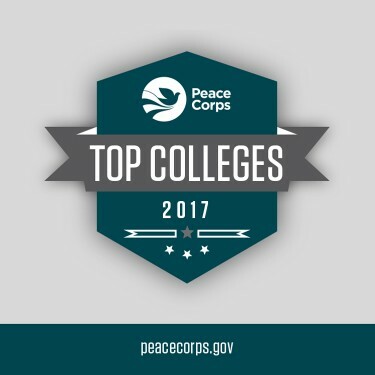 2 among large schools on the agency’s 2017 Top Volunteer-Producing Colleges and Universities list. There are 73 Huskies currently volunteering worldwide. Since the Peace Corps’ founding in 1961, 2,981 UW alumni have traveled abroad to serve as volunteers. UW ranks No. 3 all-time for total volunteers and has achieved elite top three status in the large school category for 13 consecutive years. Service in the Peace Corps is a life-defining, hands-on experience that offers volunteers the opportunity to travel to a community overseas and make a lasting difference in the lives of others. Nicole Peltzer, a 2014 graduate of UW who is currently serving as a Peace Corps volunteer in Nepal, is proud to see her alma mater at the top of the rankings this year. Peltzer was inspired by her professors and public health classes at UW, and she now applies her knowledge to her food security work in Nepal. This year’s rankings follow the launch of a refreshed brand platform that underscores the agency’s commitment to putting the user experience first, making Peace Corps more accessible to audiences through the platforms it already uses. A simple and personal Peace Corps application process can be completed online in about one hour. Applicants can learn more about service opportunities by assignment area, country and departure date by visiting the Peace Corps website and connecting with a recruiter. The Peace Corps ranks its top volunteer-producing colleges and universities annually according to the size of the student body. View the complete 2017 rankings of the top 25 schools in each category here and find an interactive map that shows where alumni from each college and university are serving here.